When I began the Promoted Pins ad campaign, I uploaded two pins. 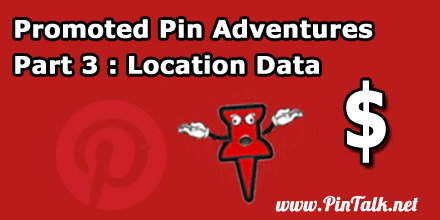 Each pin had the same settings for location, keywords, max spend per click and maximum daily budget. Last night I made some campaign changes including extending the campaign for another week and removing all the location restrictions. Initially, I set up the paid Pinterest ads to run for seven days with little insight on how well the ads would perform. The setup process offers a rough estimate (Figure 1) for the number of impressions an advertiser can expect, but that’s it. Promoted Pins does not allow advertisers to deposit a chunk of money and then spend it. The system charges credit cards as the campaign spends. This is a big advantage over Google Adwords. In Adwords, advertisers upload a deposit and cannot get a refund on unspent funds unless they completely close the account. The Pinterest billing system much better although I admit I do not know how often it charges my card. My ads are getting a decent amount of impressions, 4.5k over four days, but they are not netting click-throughs. Without clicks, the ad budget does not exhaust itself and the website does not gain any new viewers. Last night I went and removed all locations restrictions. I chose to make this change after a quick, unscientific random sample of users. A search for popular keywords such as “recipes” and “fitness” turned up many users who did not have their location listed on their profile. Theses search results showed me my ads would never get many clicks. Less than 30% of users had a location set in their profile, no matter what term I searched for. I removed the cities from my ad settings, lifting that restriction in hopes of getting more impressions and clicks. This means the ads are visible to anyone who fits the remaining criteria, regardless of location. Remember the user’s location is the location they declare in their profile, not where they actually are. There is no dynmic location sharing like there is in Twitter, Instagram and Facebook. 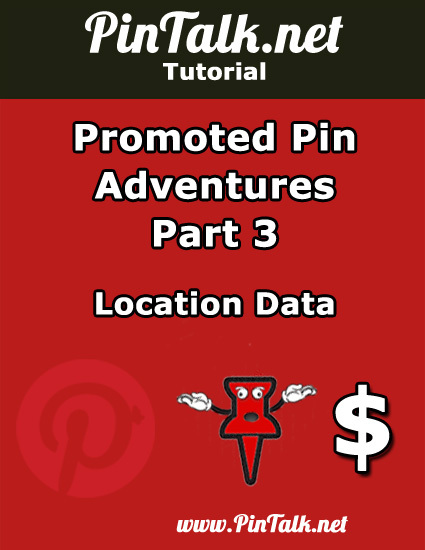 Next Next post: Promoted Pin Adventures – Part 4: The Pinterest PPC Campaign Spends!